The Port of New Orleans’ Seabrook Railroad Bridge is a double track Strauss heel trunnion bascule bridge, located in New Orleans, Louisiana. The project design and construction presented extraordinary challenges to engineers and contractors familiar with movable bridge construction. The circa 1923 bridge, due to severe deterioration of primary load carrying members necessitated the required repairs that included replacing the entire railroad floor system and truss bottom chords. 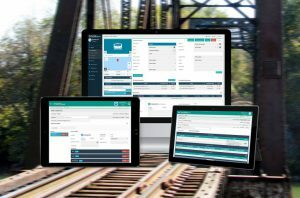 The technical engineering aspects of the project had to meet the needs of the rail and marine interests by minimizing traffic interruptions and maintaining rail operations on the busy rail corridor. The Seabrook Railroad Bridge is a Strauss Heel-Trunnion Bascule Bridge located in New Orleans, Louisiana and owned by the Port of New Orleans. Built in 1923, the through-truss bridge originally carried two railroad tracks inside of the trusses and two single lane roadways cantilevered outside of the trusses. The bridge is originally one of three duplicate bridges which cross the Inner Harbor-Navigation Canal (IH- NC) which links the Mississippi River to Lake Pontchartrain. Of these three bridges, only one bridge other than the Seabrook bridge remains in service. The Seabrook bridge crosses the canal adjacent to Lake Pontchartrain and is subject to frequent lake inundations of brackish water. 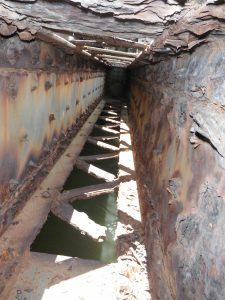 Over the past 95 years, the original paint coating deteriorated which resulted in severe corrosion of the existing metalwork within the splash zone, including the railroad and highway floor systems and bottom chord elements. The deterioration of the highway floor system components prevented traffic from using the bridge and the roadways were closed. 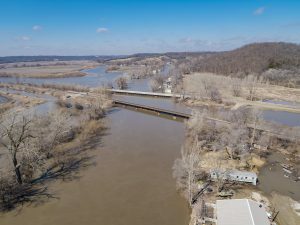 In order to maintain the bridge’s future capacity to continue to carry railroad loads, significant remediation of deteriorated splash zone components was determined to be required. The remediation of these bridge components began with the removal of the existing cantilevered roadways comprised of floorbeams, stringers, bottom laterals and decking, during an emergency project in 2014 to keep these components from falling into the channel and becoming a hazard to navigation. During this removal project the balance condition of the bridge had to be maintained throughout construction as the cantilevered roadways were removed. Six panels of ballast beams were added outboard and inboard of each truss beginning at the bascule toe to counter removal of the cantilevered roadways. Following the 2014 roadway removal project, the existing railroad floor system and bascule truss bottom chords remained in severe condition and warranted complete replacement. The subject project included replacement of the entire railroad floor system comprised of floorbeams, stringers, truss bottom laterals, and truss bottomchords from the toe end of the bascule span to the end of the tower span. Elements of existing bottom chords juxtaposed about the main trunnions had upper compression elements strengthened and lower corroded tension elements replaced. The subject design project was developed during the first ten months of 2016. The construction project began in November 2016 and was completed December 2017. The bridge’s double track rail traffic is operated by the Norfolk Southern and approximately 15 trains per day cross the span on inbound and outbound tracks, including a northbound and southbound Amtrak. 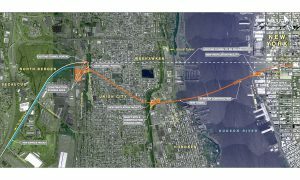 The stakeholders at the site included, the Port of New Orleans, several boat builders who have businesses located just south of the bridge on the IH-NC, Norfolk Southern and the United States Coast Guard. In the early stages of the design phase and after several meetings with stakeholders, a construction matrix was developed to describe five viable construction alternates. The construction alternates listed construction time, railroad and marine closure durations, estimated construction cost, and advantages and disadvantages. Each construction alternate included 3 months for shop drawing review and fabrication, as well as two months for mobilization and demobilization. The five alternates included Construction Alternate ‘A’; a 30-day continuous rail and marine closure with two months of limited marine closures, Construction Alternates ‘B’ through ‘D’; which had 3-day, 12-hour marine and rail closure weeks that varied from 16 weeks to 32 weeks with rail only on one track throughout construction, and Construction Alternate ‘E’; a 30-day continuous rail and marine closure with two months of limited marine closures, but this alternate also included construction of a shoo-fly to maintain a single track for rail traffic. 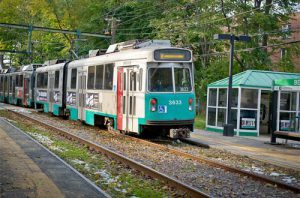 Construction Alternate ‘B’ was deemed favorable to the project due its estimated 12-month construction time, cost of approximately $6 million and the 16 weeks of 3-day marine and rail closures required for the floor system and bottom chord changeout. The construction matrix was further refined to incorporate agreements brokered by the Port of New Orleans with the Norfolk Southern Railroad and the US Coast Guard that changed the closure weeks from 16 – 3-day closure weeks to 14 – 4- day closure weeks that coincided with 86-hour continuous marine closures. Transition to a 4-day closure week and detailed step-by-step construction sequences for each major work item provided confidence to the stakeholders that one panelized floor system and bottom chord panel could be replaced within one 4-day closure week. This enabled further refinement of the 14 closure weeks into 10 closure weeks required for the floor system and bottom chord replacements, 2 closure weeks required for bottom chord strengthenings and partial replacements, and 2 closure weeks required for bearing replacements. 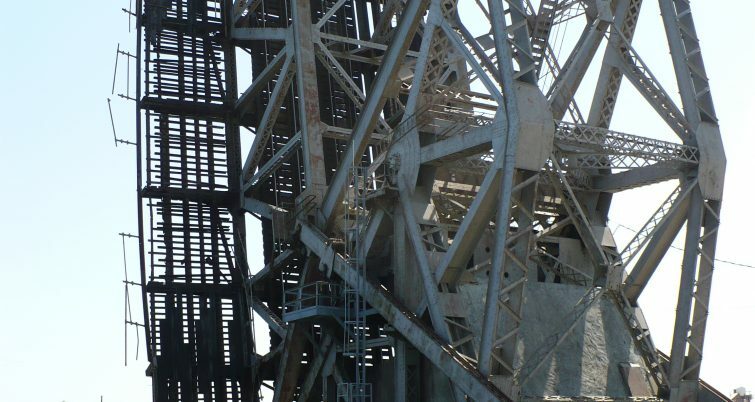 The existing built-up riveted floorbeams and rolled I-beam stringers were replaced with built- up welded floorbeams and rolled I-beam stringers heavier than the weight of the elements removed. This was done to remove half of the ballast beams that were added during the 2014 emergency roadway removal project. All replacement material was ASTM A709 Grade 50 that was shop primed with a zinc primer and field coated with two coats of coal tar epoxy. Existing and replacement stringer spans were spliced to accommodate transitions from existing elements to replacement elements between closure weeks. Existing built-up riveted bottom chords, comprised of web plates, angles and double lacing, were replaced with two types of chords. At panels with low dead load, located at the first bascule span panel and the rear tower panel, in- kind chord replacements comprised of inward facing built-up welded channels and stay plates were designed. All other bascule bottom chord replacements were comprised of welded outward facing built-up channels. These chords were spliced near each truss panel point to panelize the work. With this panel replacement strategy, one chord panel along with one floor system panel could be changed out per closure week. These replacement chords were stood-off of the existing gusset plates three inches with steel plates, so the back of replacement chord webs would clear the rivet heads on two existing chord splices located along the existing chord. All replacement floorbeams and bottom chords were attached to truss gussets using temporary ASTM F3125 Grade A325 bolts followed by permanent ASTM F3125 Grade A490 bolts. For replacement bottom chords, this was done after existing chords were removed. Existing bottom chords about the main trunnions were strengthened. On the bascule side of the main trunnion, the 14’ long chord consists of a top compression box comprised of web plates, four angles and double lacing, and a bottom tension strut comprised of side plates and two angles. The top box was strengthened by adding four angles, one in each corner of the box spliced at midspan. These new angles were the same length as the compression member, and as such, required fill plates as the angles were attached to the truss gusset plates. This box required one-half of the dead load compression of 425 kips be removed from the member so that one-half of the top and bottom existing double lacing could be removed for painting access without reaching the member’s critical buckling stress. The bottom strut was replaced in-kind one-half at a time. On the tower side of the main trunnion, the 21’ long chord consists of a top compression element comprised of a continuous web and side plates, two angles and single lacing, and a bottom tension box comprised of web and side plates, four angles and double lacing. Existing 8-foot long web plates between splices exhibited long corrosion holes and were replaced. The compression capacity of the existing box allowed no more than 2 feet of existing web and two panels of lacing be removed at one time. Installation of four web splices over the 8’ web replacement zone required a repair sequence. This existing chord also required one-half of the dead load compression to be removed. After the continuous web was replaced, the bottom tension box was replaced in- kind one-half at a time. This type of bascule bridge under dead load is affected by the 2-million-pound counterweight and required jacking procedures to transfer compression load out of existing chord members for replacement. The counterweight pulls the bascule span toward the main trunnions placing the bottom chord in compression and the top chord in tension. To take advantage of this, a separate sequence was developed to have dead load, live load, and impact load in the replacement bottom chords. This sequence began with installation of replacement bottom chords on ASTM F3125 Grade A325 temporary bolts, followed by installation of jacks and jacking struts centered about the existing bottom chord above and below the chord followed by loosening nuts on the temporary bolts, then jacking the dead load out of the existing chord, removing the existing chord, and replacing temporary bolts with permanent ASTM F3125 Grade A490 bolts one at a time. Lastly, the jack pressure was relieved to place the loads on the new chord. The 14 closure weeks were broken up into 7 weeks of four 12-hour rail and 24-hour marine closures and 7 weeks of four 10-hour rail and 24- hour marine closures. The 10-hour closures were a requirement of Amtrak to accommodate an early inbound train and a late outbound train each day of the week during the last 7 closure weeks that included the New Orleans Mardi Gras Season. The closure weeks would begin in January 2017 and end in April 2017. During the Pre-Bid process the contract required the contractor to have 50 percent of fabricated material on site prior to the first closure week. Also, Norfolk Southern Railroad agreed to operate on one track which meant the contractor would only need one track in service by the end of each closure period. This requirement and concession provided the stakeholders greater confidence that the contractor would be able to complete the contract within the time allotted. The Contract was awarded to Complete Engineering & Construction Company based out of Lafayette, Louisiana, the sole bidder at $6.7 million, and the Notice to Proceed was issued to the contractor on November 4, 2016. The first closure week would begin on January 9, 2017. This meant the contractor had to develop shop drawings, obtain the engineer’s approval of the shop drawings, fabricate a least 50 percent of the material, and ship it to the site before January 9, 2017. This goal was met by the contractor developing the shop drawings based on as-built shop drawings that were field verified, and by taking field measurements at the site. Most replacement floorbeams, stringers, and bottom chord shop drawings were approved by the end of November 2016 and fabrication of these elements was completed by the end December 2016. During this time the contractor also replaced thousands of rivets with ASTM F3125 Grade A325 temporary bolts. Before the start of the first closure week more than 50 percent of fabricated steel arrived at the site. 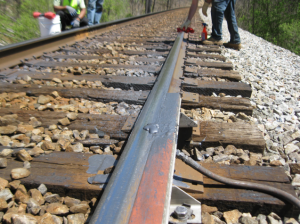 During the first three 12-hour days of a typical 4-day closure week, the contractor replaced rivets with temporary bolts, installed stringer splices on four existing stringers, installed a replacement outboard bottom chord and standoff plates, removed a portion of existing floorbeam web and connection angles and installed the inboard replacement chord and standoff plates, and converted continuous rail of the live track to jointed rail. All of this work was completed prior to the 4th day, the floor system changeout day. There were twelve 4-day closure weeks allotted for floor system replacement and bottom chord replacement and strengthening. The first floor system replacement, the end floorbeam and stringer stubs located at the toe of the bascule span, lasted 10.5 hours. The final floor system replacement, located in the tower span, lasted only 9 hours. Existing bottom chord replacements and strengthenings were performed at both trusses during a closure week. Two closure weeks were also designated for replacement of pier bearings and grillages located at the bascule toe at the rest pier. Previously, the railroad used shims under timber bridge ties to make up for the loss in the bridge bearing depth due to corrosion of the bearing plate. 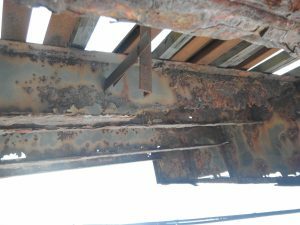 This corrosion caused a poor bearing condition for the bascule span, unacceptable span lock clearances, and rail signal issues. These issues were solved during the design phase where corroded bearing and sole plate metalwork were designated to be replaced with a stainless-steel sole plate and connection angles and shims. A thicker sole plate was provided so that shims would no longer be required at the timber bridge ties at this joint location and for span lock alignment. The contractor was required to survey this joint location from top to bottom to determine the required shim thickness to align the bascule rails with the approach rails and the span lock with the span lock receiver stand. This required the contractor to finalize this joint geometry after the pier grillages were replaced and the bearing and receiver assemblies located atop each grillage were cleaned, repainted and reinstalled. Replacement grillages were encased in two 13- inch lifts of high-strength grout and new anchor bolts were stainless steel. Upon completion, the bascule span had an acceptable bearing condition, the span locks had acceptable clearances, and the rail had consistent signal. The floor system and bottom chord replacement work were completed on April 16, 2017 and the contractor had until the end of the year to complete other work items including adding access outside both trusses, construction of a parking platform for the operators, replacing bascule navigation lighting and making final balance adjustments to the bascule span and counterweight. In December of 2016 a damaged component of the mechanical system ceased operations of the bascule span for safety reasons. This ultimately led to an additional multimillion dollar project within the subject project timeframe. Further coordination effort was required for the subject project due to an additional contractor on site. Fortunately, the balance condition of the structure during the floor system change outs was waived as the bridge was locked in the lowered position. Instead of performing balance checks after each closure week, the contractor was only required to perform an initial, intermediate and final balance check. Floor System and Bottom Chord Contractor: Complete Engineering Construction, Inc.
Gregory Taravella graduated from Tulane University with a bachelor’s degree in Civil Engineering in 1980 and has been working for Modjeski and Masters over the past 38 years and is currently a supervisor engineer of structures in their New Orleans office. Mr. Taravella has extensive knowledge in the design, construction and rehabilitation of fixed and movable bridges for rail and highway applications. Examples of these are the North Draw Rolling Lift Bascule Bridge, Florida Avenue & Galveston Bay Vertical Lift Bridges, Alexandria-Pineville Expressway and Huey P. Long Bridge Widening. Jim Costigan is a Field Engineer with the Modjeski and Masters New Orleans Office. Jim graduated from the University of Wisconsin – Platteville in 2015 with his B.S. in civil engineering. Jim is currently the American Society of Engineers Younger Member Chair for the New Orleans Branch.